View cart “Red Pill Expo 2017 on DVD” has been added to your cart. Human dignity and personal fulfillment are impossible without freedom to act, to travel, to speak, and to have property and privacy. All of these are under attack today by elitists who seek to control every aspect of our lives – and, of course, it’s for our own good, they say. All books and recordings in this section deal with that issue. The march toward modern serfdom must be stopped, but that is impossible without knowledge of who is pushing this agenda and what ploys they use to make it sound attractive to their intended victims. Here is where you will find that information. An Introduction to Freedom Force International. There is no point in worrying about the erosion of personal freedom that is the reality of our present era if we can do nothing about it. Knowledge without action is useless and leads only to apathy and despair. So the question is: what type of action can reverse this trend? Here is the answer to that question. DVD. DISCOUNT: Buy one or more additional items from this store, and this item will be discounted 20%. Many of those items also will be discounted upon checkout when paired with this purchase. They can be identified by the presence of this message above the add-to-cart button. The Audio Archives is a series of programs on freedom, monetary and health issues, dramatic events in history, and true-life adventures. 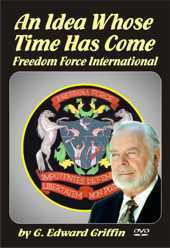 It is produced by G. Edward Griffin, President of Reality Zone and Founder of Freedom Force International. Recordings are taken from his personal collection (the largest of its kind in the world) and many were recorded and edited by him personally. This volume contains the following programs: The Creature from Jekyll Island; A Second Look at the Federal Reserve, MacArthur’s Farewell Address, Sockdolager!, and Natural Progesterone, the Amazing Hormone. This volume contains the following programs: The Hidden Agenda,The Law, and World Without Cancer; The Story of Vitamin B17 (Laetrile). This volume contains the following programs: Lesson from Austria,Politics of Cancer Therapy, and I Was A Spy for Joseph Stalin. This volume contains the following programs: Mind Control, The Ultimate Weapon; Why We Need Separation of School and State; andThe Perfect Tax. 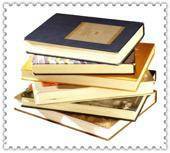 This volume contains the following programs: Medicine Man, From Major Jordan’s Diaries, and The Myth and Meaning of Monopoly Capitalism. Deep discount on this bundle of classic documentaries. Some of our most popular titles: World without Cancer, Cataclysm from Space,and The Capitalist Conspiracy. 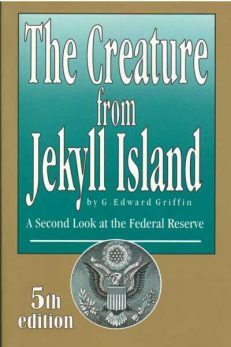 All produced by G. Edward Griffin. 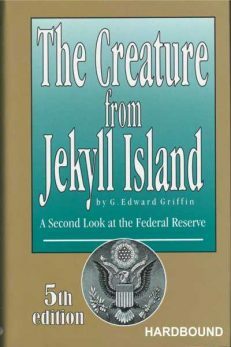 Contains the book by G. Edward Griffin, The Creature from Jekyll Island; A Second Look at The Federal Reserve and the CD of his lecture on this topic. Also contains a DVD of his discourse entitled The Federal Reserve. Deep discount. 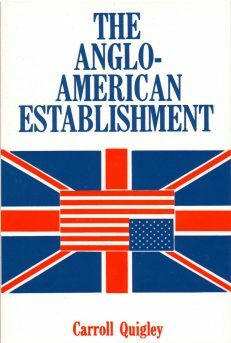 Vintage Videos by GEG Bundle contains 3 items: The Hidden Agenda, Merging America into World Government; No Place to Hide, The Strategy and Tactics of Terrorism; and Deception Was My Job, The Testimony if Yuri Bezmenov, KGB Propagandist. When purchased together, these items are discounted 40%. Where does money come from? Where does it go? Who makes it? The money magician’s secrets are unveiled. A boring subject? Just wait. You’ll be hooked in five minutes. It reads like a detective story – which it really is, but it’s all true. This may be the most important book on world affairs you will ever read. DISCOUNT: Buy one or more additional items from this store, and this item will be discounted 20%. Many of those items also will be discounted upon checkout when paired with this purchase. They can be identified by the presence of this message above the add-to-cart button. For prices on cases lots, call 800-595-6596. An Address by G. Edward Griffin. Here is a close look at the Money Magicians’ mirrors and smoke machines, the pulleys, cogs, and wheels that create the grand illusion called money. Based on Mr. Griffin’s book of the same title. Deep discount on Activist Package.